Today’s employment report shows continued signs of gradual labor market recovery. Private nonfarm payroll employment increased by 83,000 in June and the unemployment rate fell two-tenths of a percentage point to 9.5%. June marks the sixth month in a row that private sector employment has increased. These continued signs of healing are important, particularly given the recent volatility in world markets and the mixed behavior of other recent economic indicators. However, much stronger job gains are needed to repair the damage caused by the financial crisis and put the millions of unemployed Americans back to work. Total payroll employment fell 125,000 in June. This decline had been widely anticipated because some of the temporary employment related to the Census began to wind down last month. Temporary Census employment dropped 225,000 in June. Non-Census employment rose 100,000, reflecting a rise in private employment of 83,000 and a rise in other types of Federal employment. Private employment rose at an average monthly rate of 119,000 in the second quarter of 2010, up from 79,000 in the first quarter, and up dramatically from the average decline of 752,000 in the first quarter of 2009. Private employment has increased 593,000 since its low point in December 2009. Employment gains were spread broadly across industries. The biggest gains were in professional and business services (including an increase of 20,500 in temporary help services), leisure and hospitality, and education and health. Manufacturing also added employment for the sixth month in a row. Besides the decline in Federal employment related to the Census, the industries losing jobs were construction, finance, information, and state and local government. Average weekly hours for all employees on private nonfarm payrolls also declined one-tenth of an hour in June. Hours, however, are still up four-tenths from their low in October 2009. The unemployment rate fell two-tenths of a percentage point for the second month in a row. At 9.5%, the unemployment rate is now six-tenths of a percentage point below its high last year. However, the drop in the unemployment rate was driven in large part by a substantial decline in the labor force, which we expect to be reversed as employment prospects continue to improve. The household survey also found that the number of workers working part-time for economic reasons declined substantially for the second month in a row. The number of such workers has fallen 525,000 over the past two months. While this report suggests a continuation of gradual labor market repair, it is important to emphasize the magnitude of the damage that remains from the recession. Payroll employment is still down 7.5 million from its pre-recession peak and the unemployment rate is more than 5 percentage points above its pre-recession low. It is essential that we focus on accelerating job growth. That is why the President continues to work with the Congress to pass targeted jobs measures such as an extension of emergency unemployment insurance, a program for small business lending that will enable small firms to get the credit they need to expand and create jobs, and more aid for troubled state and local governments to prevent layoffs of teachers, firefighters, and police. These are fiscally responsible measures that would have a substantial impact on the rate of job growth. As always, it is important not to read too much into any one monthly report, positive or negative. 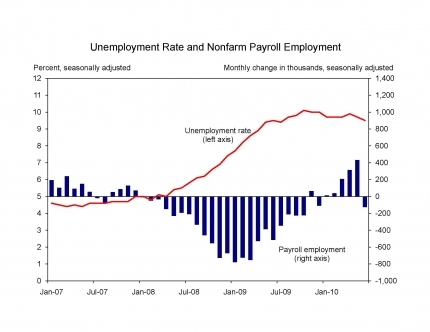 The monthly employment and unemployment numbers are volatile and subject to substantial revision. Emphasis should be placed on persistent trends rather than month-to-month fluctuations. As you can see, taking Census out of the equation makes picture look a whole lot better, with job growth of 100,000. So this month’s data is a little bit tricky, because June is one of those months where the seasonally adjusted and unadjusted lines tend to cross. That makes it difficult to compare with the previous few months. THE best that can be said about the June jobs report is that it doesn’t signal a return to recession. Total employment fell 125,000, but this was because of an end to some temporary jobs conducting the federal census. Private payrolls rose by 83,000. That’s soft, and less than expected, though better than May’s revised increase of 33,000. Unfortunately, the guts of the report aren’t much more uplifting. The private work week, after rising to 34.2 hours in May, fell back to 34.1 in June. In terms of the amount of labour being used throughout the economy, that’s the same as a drop of 300,000 in payrolls. Average hourly earnings actually fell, by 0.1%. That may fan fears of deflation given the already low readings on inflation. I think that’s premature. Hourly earnings have been generally rising, albeit sluggishly, and the June drop could be a one-time move. Finally, while the unemployment rate did drop, to 9.5%, an 11-month low from 9.7%, it dropped for the wrong reason: a lot of people stopped looking for work. This might be because a Senate impasse led to the expiration of extended unemployment insurance benefits early in June. The number of recipients has been falling by about 200,000 per week since. Some of these people may have stopped looking for work (a requirement to qualify for benefits), and thus are no longer counted as unemployed. Census layoffs may have also played a part. There is little basis for a hope of an improvement based on the establishment data. The 100,000 private sector jobs bring the average rate of job creation to just 119,000 over the last three months. With state and local governments shedding jobs at the rate of 13,000 a month over the same period, the rate of job creation over this period is roughly equal to the growth in the labor force. And there are no obvious candidates for improved growth any time soon. The manufacturing sector added just 9,000 jobs in June, after adding 70,000 over the prior two months. With the workweek shortening by 0.5 hours, there is little reason to expect robust hiring. Construction lost another 22,000 jobs, mostly in the non-residential sector. This decline is likely to continue, although possibly at a slower pace. The retail sector lost 6,600 jobs, its second consecutive decline. Finance shed 15,000 jobs, 6,500 of the losses were in real estate following the end of the homebuyers tax credit. Health care employment increased by just 9,300 in June, following weak growth in May. The sector had been adding close to 20,000 jobs a month. Employment services also showed modest growth of 35,800 after growing at twice that rate last fall. And restaurants shed jobs for the second consecutive month. The index of aggregate weekly hours fell by 0.2 percent after a big jump in May. The May number may have been overstated, but clearly there is not much positive momentum here. And wages grew at just a 1.0 percent annual rate over the last quarter. With state and local governments cutting back to deal with deficits, house prices falling again, and wages not keeping pace with inflation, there is little hope for a robust growth any time soon. It is likely that the unemployment rate will rise in the second half of the year. “Getting worse more slowly” is not “better.” There is no “upturn.” There never was. Eventually, of course, we’ll return to job growth, but expect that to take some time, especially with the economic aftershocks still rocking the world economy. If next month’s numbers look this bad, it will be pretty bad news for Democrats, who had allowed themselves to hope that things might be turning around. But it will be really bad news for households who have to manage through a long, ugly stretch of unemployment. Hopefully, this will spur Congress to stop squabbling over jobless benefits. Romer’s blog post and recent statements from and meetings with administration officials suggest that the White House’s broad approach on the economy is to emphasize how much improvement there is, rather than how much needs to be done. That makes political sense, of course: The economy has largely stabilized, which is a huge achievement, and the only chance Democrats have in the midterms is convincing the country that they’re responsible for that stabilization. But it also makes it difficult for the White House to run around with its hair on fire about how bad things are and how necessary it is that Congress doesn’t abandon the labor market in order to pretend to care about the deficit.